TORRANCE, Calif., Sept. 29, 2016 (SEND2PRESS NEWSWIRE) — DocMagic, Inc., the premier provider of fully-compliant loan document preparation, compliance, eSign and eDelivery solutions, announced that Corporate Settlement Solutions (CSS), a title and settlement services company, has successfully implemented DocMagic’s Total eClose™ solution. As a result, CSS can offer a completely new customer experience, gain a competitive advantage, and remain 100 percent TRID compliant at all times. CSS combined DocMagic’s functionality, services and integrations into a single offering to create an easy-to-use, out-of-the-box eClosing solution. DocMagic’s Total eClose functionality unites eNote, eSignature, eNotary, MERS eRegistration, eDelivery, and eVault services to provide a highly-efficient, paperless end-to-end eClosing. In addition, documents that need to be notarized can be conveniently eSigned and eNotarized without leaving the comfort of their home. After the introduction of TRID and its increased liability for lenders and their assignees, if you originate, sell, buy or service loans, you must be able to demonstrate TRID compliance years after a loan closes. DocMagic’s system provides electronic proof and evidence of compliant transactions for future audits with a date and time stamp audit trail of everyone who has touched the transaction at any level. From the original loan application and Loan Estimate (LE) to receipt of delivery of the final Closing Disclosure (CD), data, calcs and documents are stored in an eVault to provide the ability to replicate proof of compliance. With TRID’s increased compliance requirements and soon the implementation of the new Uniform Closing Dataset (UCD) requirement, the future is in fully-electronic transactions that help lenders meet strict timing requirements and provide the ability to fully recreate all compliance checks at every point in the transaction. The CFPB and industry experts agree that it’s better to adopt and implement the technology and processes to make eClosings a reality now as opposed to later. Interested parties can sign up for a demo of the eClosing solution on CCS’ website by clicking here: http://www.visitcss.com/electronic-closings/. Corporate Settlement Solutions (CSS) is a dynamic, forward-thinking group of real estate settlement service professionals with a focused passion for providing a superior customer experience. The company started as a local title agency in northwest Michigan in 1992. CSS’ growth fostered expansion into a regional vendor management company offering a full range of title, closing, valuation, flood, and recording products. The company offers powerful title software for accurate and efficient title and settlement transactions as well as an and-to-end eClosing solution. For more information, go to www.visitcss.com. 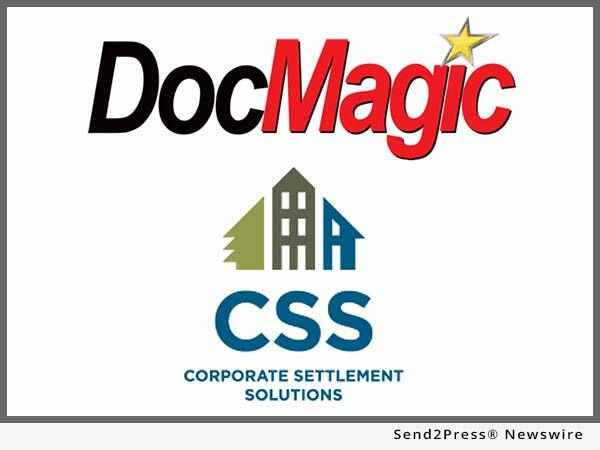 “We are excited that CSS is successfully leveraging our Total eClose solution to provide a completely electronic closing process for their customers,” said Dominic Iannitti, president and CEO of DocMagic.